Ants can be extremely difficult to control because they are resilient and adept at finding different habitats where they can thrive. The key to successful ant control is proper identification. Once you know what ant species you are trying to control, it is a lot easier to put together an ant management program. Different ant species can be predominantly protein or sugar feeders, which will determine your bait selection. Additionally, by understanding the meteorological factors at play such as ambient temperature, pending or post rain and drought is useful, as this will influence colony behaviours including foraging, hibernation and mating flights. Taking a consultative approach and demonstrating your experience through inspection, identification and diagnosis will yield better results with your customers. And will also build your reputation as a professional pest controller which in turn should generate more business through recommendations and referrals. 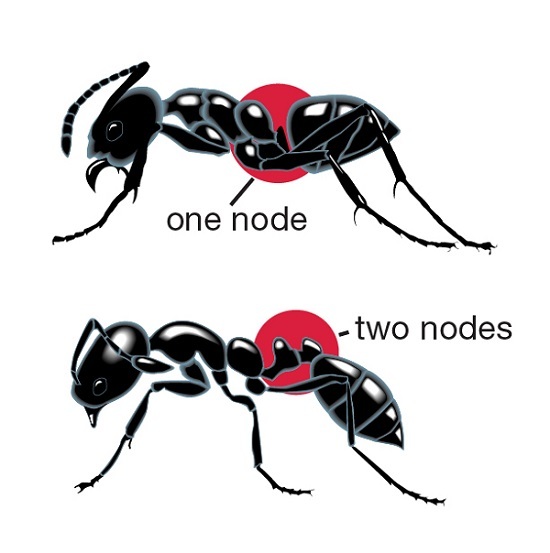 Ants can be divided into two groups: those with one node and those with two nodes. The segment between an ant’s thorax and abdomen is called a pedicel and has either one or two segments called nodes. There are four key elements of an effective ant program that will help make control simpler and more successful. Thorough inspection: Inspect for any ants both indoors and outdoors looking for ant trails, scouts, ingress points and nests. Pay close attention to overhanging foliage, adjoining structures (decks or pergolas), exterior cracks, gaps, garden beds, entryways and shaded areas that could be a source of food or water. Remember you are treating a colony in an environment, not a lone insect. Indoor treatment: Trails and their surrounding areas can be spot-treated with ARILON insecticide. If trails are located with a strong population of ants, OPTIGARD Ant or ADVION Ant gel baits can be used immediately adjacent to, or in cracks and crevices in the areas where ants are or have recently been seen. It is sometimes necessary to treat entry points to deter foraging (or scout) ants indoors, such as areas around doors and windows frames, weep holes or even in subfloors and under the eaves and awnings. DEMAND is ideal in these situations. Outdoor baiting and spot treatments: Offering an alternative food source by applying OPTIGARD Ant Gel or ADVION Ant Gel immediately adjacent to the foraging trails outside of a structure, is an ideal way of treating ant infestations. Ants will ingest the liquid component of the gel, or physically take the solid component back into the nest for further feeding (insecticide transfer) to nest mates. For direct nest spot treatments, liberally treat nest areas and ant colonies with DEMAND liquid insecticide. For sparse ant activities that may be linked, treat soil surfaces with ARILON (a non-repellent) Insecticide. Inspect garden beds, landscape ornamentals and plants (e.g. palms and succulents) that are close to the home as sources for water and food. Applications or items such as fertilizer or manure (dog droppings), flowers (pollen) or plants with naturally occurring sticky sap etc. can be a commonly overlooked as a source of sustenance for ants. Caution should be taken with other native and non-native pollinators (wasps, butterflies and bees etc.). Other insects such as honeydew-producing insects, can also attract and encourage ant populations. These tertiary insects may need a differing treatment approach, so please, consult the product label or a local horticulturalist. Perimeter application: DEMAND insecticide is very effective as perimeter treatment, which is extremely helpful when ants are trailing from adjacent properties or structures. When applied at recommended rates, DEMAND creates a complete control band around a structure by releasing more than 10,000 microcaps per square inch of a treated surface. ARILON is also effective as a large-volume application. It can be diluted and applied at high volumes to provide comprehensive coverage, resulting in a more thorough control. By following these four steps and utilizing the range of products offered by Syngenta, you can win the battle against invading nuisance ants.